Our modern societies and the fast pace of life have undermined community socialization. People lack trust and real connection to other people. Their main drive of action and being seem to be growth and profit-oriented activities, promoting competitiveness instead of compassion and solidarity. BBB committed to its goal to raise dialogue among the youth in line with the Festival theme, “Societies on Sharing”, added in its parallel activities the workshop “A person is a person through other persons Workshop” inspired by the activities of the STEP educational module. 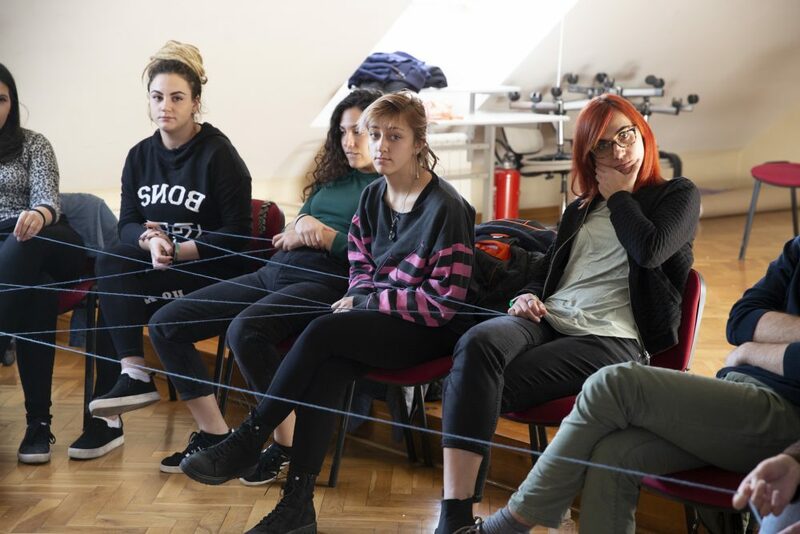 In this workshop, participants explored an alternative imaginary beyond competition and towards mutual concern, caring and sharing between and among people, as well as with the wider environment. Participants shared their life experiences of cooperation and learned about the Ubuntu philosophy of Bantu-speaking people in Africa. Students of the Academy of Arts in Novi Sad, Serbia, together with other participants and organizers of the festival joined the workshop. During the first part, after having an energizer to get to know each other and feel more comfortable with the group, participants in teams of 4-5 discussed about the challenges and opportunities we face while we want to cooperate with other people. The challenges mentioned by the participants included stereotypes, lack of empathy, the language barrier, shyness, unethical work behaviors and close-mindedness. On the other hand, participants mentioned the importance of meeting new people, traveling, engaging in shared experiences with people with different opinions, socio-economic backgrounds and life-stories. Such exposure may help people learn to be more open, more forgiving and courageous to actively participate and listen other people and opinions by developing social abilities. For the second part, we decided to go outside with the group and play a small game which was also a social experiment. The group was staying at the one side of the Academy’s garden and on the other side there was a gift bag. “Santa Claus arrived earlier this year and left you a gift!” the facilitator, Amerissa Giannouli, certified trainer for adults of non-formal education – Project Manager at Inter Alia said and gave the mark for them to run and pick the gift bag. The idea was that the first person who grabbed the bag could keep it. Interestingly, some of the people were building a strategy to help 1 person to pick the gift and share it with the others. 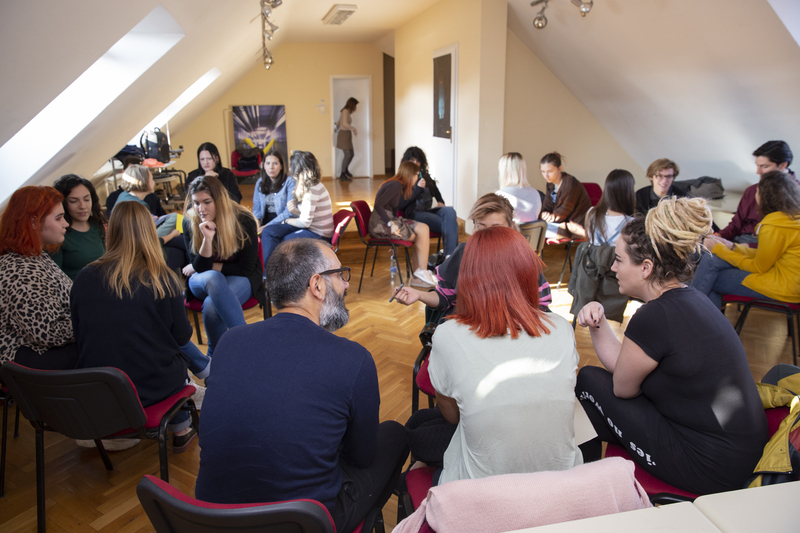 There was however a misunderstanding because at the beginning, they were talking in Serbian and then half of the group was not able to hear them or did not pay attention to what was discussed. Inevitably, only a few people run to take the bag and the first person after discovering that there were little chocolates inside decided to share them all with the rest of the group! After this small game, we returned inside the Academy and after sharing some initial thoughts, the facilitator told them a story about an anthropologist who had been studying the habits and culture of a remote African tribe. One day, he put together a gift basket filled with delicious fruits and wrapped it in a ribbon. He placed the basket under a tree and then he gathered up the children in the village. The man did a similar social experiment as we did during the workshop. When he told them to run, they all took each other’s hands and ran together to the tree. Then they sat together around the basket and enjoyed their treat as a group. Back then, the anthropologist was wondering why they would all go together when one of them could have won all the fruits. Then, a little girl explained to him that no one could be happy if the other one was not. IT was basically in their ethics of their community to feel responsible for one another. In fact, this tribe believed in the Ubunu philosophy. “Ubuntu” in their language means humanity and according to their philosophy, to be human you must practice giving, receiving, and passing on the goods of life to others. These others are our ancestors from whom we receive life as we know it; our neighbors and people of our community with whom we share life; and the future generations to whom we may pass life to which makes us also question our environmental responsibility. This is an ethical position that to be a human being is to care for oneself and others. A human is being and becoming in relation to and independence with others, a critical aspect for sustainability. Before closing the second part of the workshop, the group made reflected upon how they reacted compared to the story they heard afterwards. Some of them were happy because they also chose to share the gift. Some others questioned the activity because the result might have been very different if the chocolates were not enough for all the participants and if the object of interest was money or something more “precious” instead of chocolates. Some others said that since it was a game, they acted according to what they thought it was expected by the facilitator to happen. In their social realities, people tend to be more competitive and less cooperative even with the smallest things. A final observation from the facilitator was that in the workshop game, participants, although a bit confused, decided to give to one person the authority to take the gift and share it with the others. In the story of Ubuntu, the children went altogether to pick up the basket and share it with each other. Maybe, rather than a matter of the object of interest, it is more a matter of societal values and sense of responsibility.